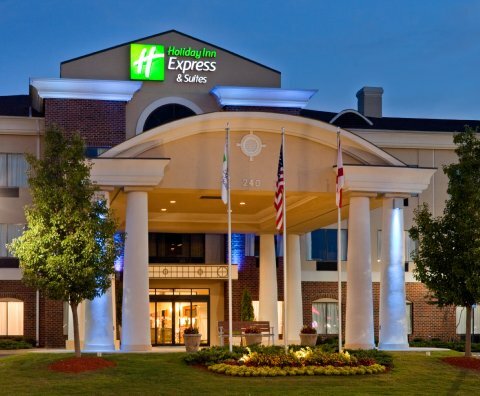 Rev up your engines and gas up your boats because the newest addition to Pell City, AL is the Holiday Inn Express & Suites, conveniently located at Exit 158 on I-20 only minutes from Talladega Super Speedway and Scenic Logan Martin Lake. You can also feel &regThe Power of Dreams&reg at Honda Manufacturing located minutes away. This hotel is located midway between Anniston/Oxford and Birmingham, yet a small drive east to Atlanta and Chattanooga. All of our rooms and guest areas feature free high speed Internet access. In the morning enjoy our deluxe complimentary breakfast buffet that also offers hot items. After a long day of work or traveling on the road our facility also offers a business center to check e-mails or print presentations, a fitness center to work out any stress, an outdoor pool with whirlpool to just unwind and oversized suites and guest laundry. If you love golf, you&regll love Pell City. Pine Harbor and the Pell City Golf Course are two attractive courses for your golfing pleasure. This beautifully appointed hotel is perfect for both the business and leisure traveler. BUSINESS:Honda, Talladega Speedway, Harley Davidson Testing, Adesa Car Auction HOSPITALS: St. Clair Regional, UAB Medical Center UNIVERSITIES:UAB, Jacksonville State University, Jefferson State Pell City This hotel is committed to providing accessible facilities under the American Disabilities Act. If your accessibility needs are not met, please contact the Hotel Manager on Duty. Should you require additional information regarding accessible facilities for guests with disabilities, please call 1-800-Holiday (U.S. and Canada) or contact the hotel directly. For the hearing impaired, TDD service is available at 1-800-238-5544 within the U.S. and Canada.